It’s not logical to repeat the same behaviors while expecting different results. For those of us who are motivated about a new beginning in 2013, I applaud you. However, be aware that if your work ethic, personal habits and spiritual focus are the same as they have been in 2012, 2013 will probably be a repeat. Resolutions can be a great tool in assisting us in improving our life situation. We should use personal goals to motivate us toward behaviors that change our conditions. Most people require accountability both in the setting and keeping of goals. I highly recommend that you set goals and share those with someone you trust. Be realistic, make tough decisions about important issues and have a long-term perspective. Your chances of success will increase dramatically. The truth is, if you can’t bring yourself to make any changes, get ready for more of the same. There really isn’t any reason to expect improvement. So, New Year, same old results, unless you change your approach! There are some positive changes I plan to make for next year, so I fully believe that 2013 is going to be a great year – even better than 2012! Join me! We should know by now that the holiday is not about the presents we receive. It really is about people. There are people who actually have to buy their own presents because there is no one in their lives. They are missing the greatest joy. My heart goes out to a friend who lost both her and sister and her mother this week. I lost my mother this year – Christmas will be a little different this year. Then I think about the military personnel who are separated from loved ones this week. There are college students, widows, orphans, many people without people in their lives. People who are incarcerated, even people who have to work through the holidays, will struggle to celebrate to the fullest extent. People make Christmas what I is. Regardless of what marketers tell us, no amount of spending on presents will fulfill the purpose and meaning of Christmas. Christmas is about people: family, friends, and loved ones. On the birth of Jesus, Athanasius of Alexandria wrote, “He became what we are that he might make us what he is.” Christmas is God coming in the flesh and shedding His blood – so that we might be saved. It’s not lights, not trees, not Santa. Christmas is flesh and blood. Be sure to share the love with the people in your life. 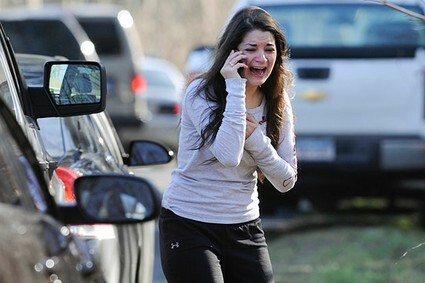 We are all sickened by the senseless murder of so many people, both children and adults, in Newtown, Connecticut. While we mourn, we also have to hear the dime store God “experts” share their not-so-humble opinions about why this devastation occurred. Facebook and blogs are filled with smug responses surrounding the crisis – ideas like: “What do you expect? We kicked God out of our schools.” and “that’s what we get for making prayer in school illegal”. Please stop this kind of rhetoric. It is hurtful to the families of the victims, it gives God a bad name and it is unbiblical. It is bad theology to say that we removed God from our schools. True, we disallowed public prayer, but rest assured, God was right there in the heart of every child who lost their life. God was there. How dare we think that we can control where God goes and doesn’t go. Reminder: He is omnipresent (everywhere at the same time). We cannot confine Him. God is close to the brokenhearted (Ps. 34:18), no force in nature can stop that. The arrogance that assumes we can answer such mysteries is unfathomable. As one friend, Eddie Robbins said, “If folks believe that, how do they explain so many shootings in churches?” Humble down, people of God. This is no time to grind an axe. True, prayer is not allowed in most public arena today, but I guarantee you that there was a ton of prayer going up in Sandy Hook Elementary School today. God was there, He was with every victim and He is with all of the survivors. To believe otherwise is heartless and in conflict with the nature of God. We need to refute bad theology. People need to stop saying hurtful things to try to prove a point. But now is the time for mourning and praying, not arguing.